My role as an artist is to draw awareness to the materials we use everyday, to shift and change them so the viewer can focus on their form and materiality. This work engages with repetitive construction and the repurposing of familiar objects, to promote and create the unfamiliar. Underlying the work is a quiet foreshadowing of the discussion on excessive plastic use… do we really need plastic spray bottles? Maybe we do? The site for this work, a room in the new RAH is still, grey and sombre. The work Substituted, is loud, colourful, and visually demanding. 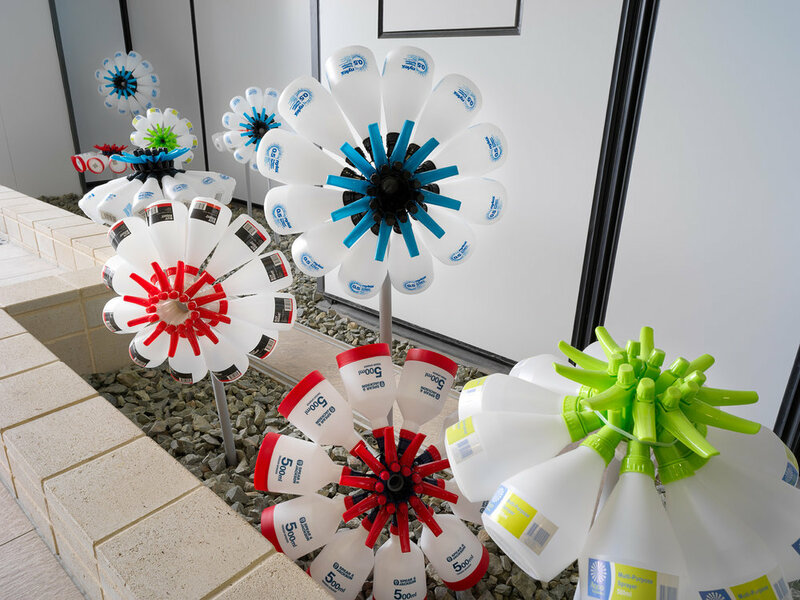 It is sympathetically site specific as it playfully explores the cultural tradition of ‘taking flowers to hospital’. When our loved ones are sick, we take them flowers. Cut flowers rely heavily on water to lengthen their short life whereas this work subverts the fragility of the cut flower, instead highlighting the terrible tenacity of plastic and its environmental cost.